She was one of more than 1,000 Women Air Force Service Pilots — or WASPS — who went unrecognized for more than 60 years. And just this year — in March — the women who flew during World War II finally got their due. They were given the Congressional Gold Medal at a ceremony on Capitol Hill. Many of these women volunteers have died. At first they were known as Women’s Air Force, or WAFS. With hopes of joining the military in the early years of World War II, they often paid for their own pilot training. They tested and ferried aircraft, freeing men to combat flying. With Memorial Day approaching, I stood at the grave of Kay Lawrence this past week. I thought about the group of about 40 people who gathered there in October 2006. It had been 63 years since her death before there were military rites. At that time, the flag was folded over her grave by an honor guard unit from Grand Forks Air Force Base, Chaplain Shin Soh read Psalms 146 and said Kay Lawrence died to preserve liberty and freedom in this world. 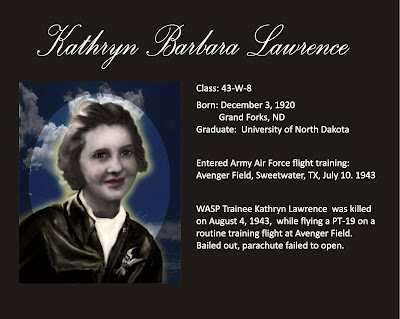 Above & Beyond--Kathryn Lawrence from Wings Across America's "Fly Girls" exhibit. The air was cool and crisp that day, and the sun filtered through trees that had lost their leaves. The gun salute was heard and taps sounded throughout the cemetery. Kay Lawrence is buried next to a brother, William E. Lawrence, who was killed in action with the U.S. Marines in 1944. “It was at Palau Islands,” said a nephew, Mike Lawrence, who lives in Grand Forks. He says William, who was born in 1925, fudged a bit on his age to go into the Marines. With the annual time for remembering the dead from all the wars, the story of Kay Lawrence is worth retelling. She grew up in Grand Forks, and she was the lone woman in a class of 39 young men learning to fly at UND. It was a daunting task for a young woman who was 5 feet 4 inches tall and weighed 125 pounds. She finished the course on June 11, 1940, and graduated in 1942 without a chance to use her pilot’s wings. She went to Seattle and worked in the Boeing plant. It was there she ran into a recruiter and headed for training with the WASPS in Texas. She began her training in Class 43W8 at Avenger Field in Sweetwater, Texas. Less than a month later, on Aug. 4, 1943, her PT-10 plane went into a vertical dive, spinning out of control. Her parachute did not open, and she died at the scene. In 1994, the national WASP organization sent a letter to UND requesting information about Lawrence, whose full name is Kathryn. They were compiling a book about the 38 women fliers who died in their nation’s service during World War II. UND transcript clerk, Pat Larson, set out on a search to find out all she could about Lawrence. Her UND student files were found along with her obituary on Herald microfilm. They sent the information to the WASPS and then began to seek our family and friends in Grand Forks. At that time, there was a drive to set up an endowment in the name of Kay (Kathryn) Lawrence. They wanted it to help finish the work of women in aviation that Kay had started. The WASPs were almost forgotten when the Air Force in 1976 began installing women as pilots. The movement to mark the graves of the WASPs was an initial step along the way to honor their memory. And the movement to recognize the women who served so long ago was won when President Barack Obama signed the bill to honor the women with the Congressional Gold Medal. Since then, a bronze grave marker identifying Kay Lawrence as a World War II WASP has arrived in Grand Forks and will be on her grave on Memorial Day. There is a feeling at the grave of Kay Lawrence in Memorial Park in Grand Forks that a wrong has been righted. Reach Hagerty at mhagerty@gra.midco.net or by telephone at (701) 772-1055.